Rocomamas is just the kind of place I was looking for, for Burgers. I'm done with the chain burger restaurants! This one is definitely my top favourite place for burgers now that I've visited them. 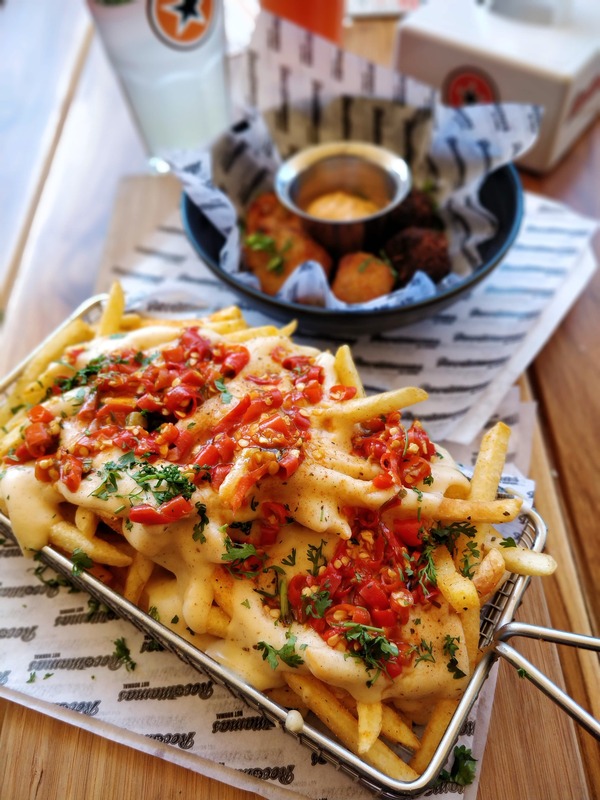 So here are a few things about Rocomamas, the outlet here in Kharadi is the first in India and this brand has made it's way all the way from South Africa! Their outlet here, has a lot various options, made to suit the Indian palates, but also they do use a lot of spice mixes and other ingredients are flown all the way from South Africa to keep true to the brand. They are known for their smash burgers, well this concept doesn't apply to the Vegetarian burgers. Their interiors are quite similar to the other outlets and have a very bright yet fun vibe to it! Getting to the food I tried, I highly recommend each of the mentioned items cause I thoroughly enjoyed them! Chilli Cheese Fries - These were perfect! High on cheese and HIGH on chillies. My mouth was on fire after eating 'em but I enjoyed it! They could go a little low on the chilli nonetheless, loved it! Cheese Jalapeno Bombs - No amount of cheese is enough for me, and as you read further you'll believe this. Yet another delicious appetizer, with a special house-made dip! Chilli Cheese Bomb Burger - The burgers here are loaded, and this one was with cheese, it had one of their chilli cheese bomb (similar to the cheese jalapeno bomb), cheddar and mozzarella with a delicious patty. Paneer Tikka Burger (in a charcoal bun) - Yet another lip-smacking burg in charcoal buns, with a minty Mayo and a chunk of paneer! Also tried a couple of their mocktails which were super refreshing and go well with the burgers! Can't wait to visit them again and try out the other Burgers they have to offer!